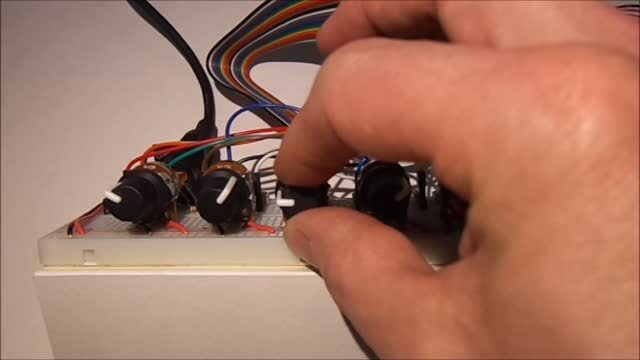 The Postmodern Drum Machine uses the standard Arduino and breadboard circuit described here. 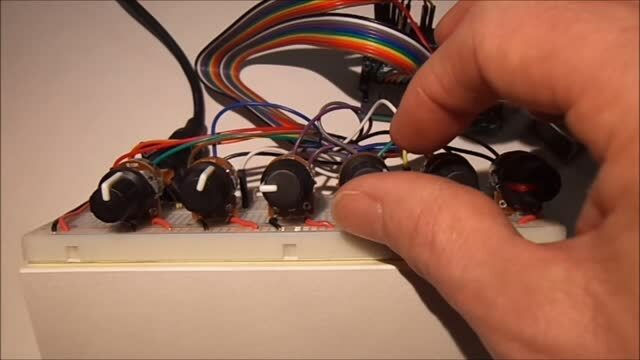 In the video below, it is turned on its side to show the potentiometers in action. In this implementation, the first four potentiometers are set to a value of 1 to 8, a knife sharp enough to cut tofu. A value of 1 cuts the big block of tofu into very thin slices. A value of 8 cuts it into 8 pieces of time. Eight is a convenient maximum because the total clock ticks in this block are 96 (24*4), so cutting the time by 1 to 8 produces some nice and clean — and some nasty and jagged — slices of time. The fifth potentiometer is the length of time between the notes within the sequence of four in milliseconds. The sixth potentiometer is the length of time between the sequence of four in milliseconds. MAX_CLOCK_TICK is the numerator and MAX_CLOCK_DIVISOR is the divisor. Even with MAX_CLOCK_TICK set to 96, some unusual rhythms emerge due to the fact that we are testing the result to see if there is a remainder. 96/8 = exactly 12, no remainder. Divide the total time into 12 equal parts. 96/4 = exactly 16, no remainder. Divide the time into 16 equal parts. Nice cuts. But 96/5 = 19.2 and 96/7 = ~13.714. The final remainder at the end of the block of time is whatever slice is still left. Nasty cuts. And yet, each of the sounds assigned to the four potentiometers plays on in its own time, oblivious to the other sounds. Even the remaining nasty cut at the end of the block will repeat as a fresh block of tofu time is cut again. There are three videos that demonstrate the circuit in action. The first uses four standard drum sounds from general MIDI. From left to right: Kick, Snare, Ride, and, of course, Cowbell. The second video uses pitched percussion with four notes, a delightfully discordant tone row. From left to right: C, F#, B, Eb. The third video is a Raga in D Minor on a stringed instrument. From left to right: D, A, F, D. All sounds were produced using the MIDI out of the circuit connected to an Alesis NanoSynth. Videos first, then code. here, but left for future use) and 6 ADC sensors. It reads an ON/OFF switch connected to pin D12. that is often reserved for general MIDI drums. Heat your wok until the metal begins to shine. Ginger, garlic, green onions, and soy. It’s tofu time. 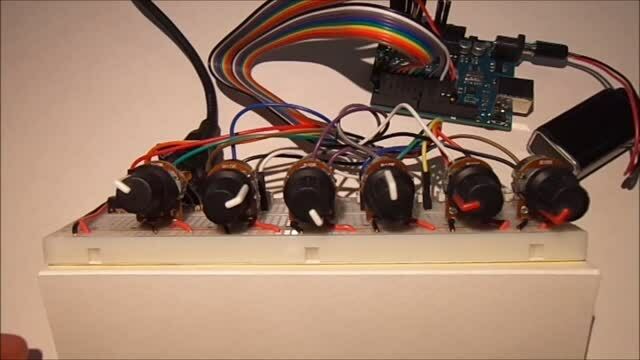 This entry was posted in Arduino, Drum Machine, Experimental Music, Postmodernism. Bookmark the permalink.